A Screen One Special drama for Hallowe’en by Stephen Volk, starring Michael Parkinson, Sarah Greene, Mike Smith, Craig Charles. Ghosts no longer inhabit stately homes and rattle chains. They live in ordinary council houses like that of Mrs Pamela Early. For months she’s suffered strange noises, awful smells and bent cutlery, but is her’s really the most haunted house in Britain? BBCtv turns the cameras on the ghoulies, ghosties and things that go bump in the night. 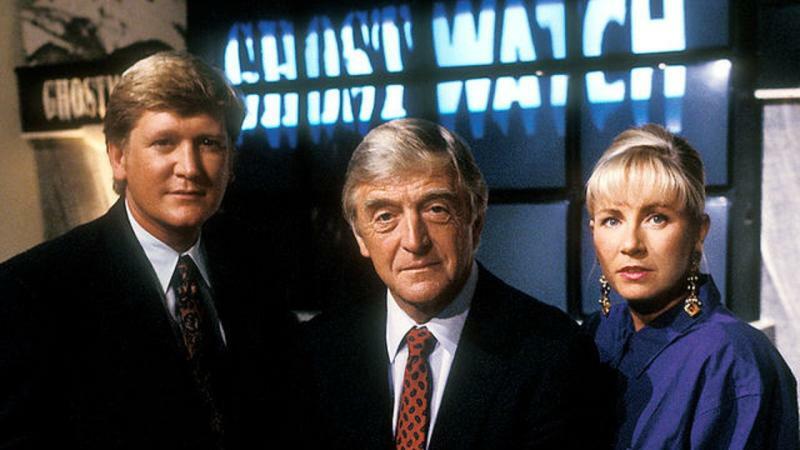 Such was the furore Ghostwatch caused after its first and only ever BBC broadcast on October 31, 1992 that the staff of the Radio Times was briefed never to mention the programme again. The programme is a perfect pastiche, a flawless illusion of reality with a tongue-in-cheek sense of drama and narrative: combining a live studio broadcast with a phone-in and cutaways to various outside and on-location broadcasts, the first 30 minutes of Ghostwatch appear to be an actual one-off production that hopes to, in presenter Michael Parkinson’s words, ‘show for the first time irrefutable proof that ghosts really do exist’. The programme begins by establishing the outside broadcast at the reputedly haunted home of the Early family. Co-hosts Sarah Greene and Craig Charles are at the location with Greene allocated the role of eyewitness in the house while Charles conducts vox pops with the local residents. From then on, Ghostwatch follows the set format of countless news and investigative programmes: Parkinson interviews parapsychologist Dr Lin Pascoe (Gillian Bevan), a dialogue that is interspersed with live coverage from the house, the odd vox pop, live telephone calls monitored by Greene’s real-life husband, Mike Smith, and a counter-argument from a sceptic who offers his opinion, via satellite link, live from New York. The first successful strategy Ghostwatch deploys is its use of Parkinson, Greene, Smith and Charles: at the time of its broadcast, these four were both familiar and popular television presenters whose presence lent authenticity and authority to the programme. This was particularly true of Parkinson who had, by 1992, become a celebrity through his regular BBC chat show, in part for his willingness to ask the questions others would not. As a consequence he was, in his own way, the voice of the people, a figure whom the audience trusted (1). As the programme begins its investigation into the haunting, small events occur – the cameraman’s watch stops, the sound of scratching can be heard behind the walls, a damp patch appears, and then heavy clanging on the central heating pipes reverberates through the house. As frightening as these may seem, it becomes apparent that at least one of the occurrences has been faked by one of the Early family’s children, the prepubescent Susan (Michelle Wesson). As Susan claims she was made to act that way by the ghost, whom she has named Pipes, Parkinson tries to round up the show with some concluding remarks from Pascoe. Here Volk uses Parkinson’s persona to the full, as he bluntly questions a distressed Susan and then Pascoe about the hoax. His questions do not necessarily undermine the parapsychologist’s authority but imply that she has been as misled as everyone else. Yet despite Parkinson’s confrontational questioning, Pascoe is unwilling to believe the years of poltergeist activity have been a hoax and she warns, in an ominous tone, that things are only just beginning. This scene reverberates throughout the remainder of the programme for Pascoe’s sustained belief becomes so convincing that she virtually usurps Parkinson’s role as the programme’s voice of reason. At this point, Ghostwatch shifts from what appeared to be a genuine news programme into a contemporary fictional ghost story as the subsequent dialogue and events are all clearly engineered to generate the maximum amount of tension and fear: there are repeated references to cats scratching at the walls or screaming; tension between mother and daughter and the family and the film crew mounts; lights begin to flicker; the children refuse to leave the house; a picture flies off the wall; a mirror falls and shatters, severely injuring the soundman; the seemingly spectral cats start screaming again and Susan is found to have her face covered in scratches. All are interspersed with live calls to the studio that slowly reveal the horrific truth about the house. Events take a dark turn as chaos reigns and concludes with the abduction of Susan and Greene, both seemingly assaulted and probably killed by the ghost of Pipes. This graphic escalation of events should have been enough of an indicator to the audience that Ghostwatch was indeed fake, but such was the quality of the programme’s verisimilitude that the spectral events sustained the illusion of reality instead of breaking it. Herein lies the programme’s greatest strength: it mimics the visual language of reportage television so fluently that its fiction is, in some way, successfully incorporated into the illusion. The expected unsteady camera work, the poorly composed images as the cameraman adjusts his framing, the use of cutaways, vox pop and live calls all function to create a genuinely frightening work of fiction while simultaneously declaring it as real. It is the perfect synthesis of technical craft and concept, a true perversion of the language of television. This sense of realism is further established by apparent mistakes: the cutting to an unprepared presenter; production crew appearing on the stage and ushered off by Parkinson; a video tape being rewound while being broadcast. These are small and seemingly insignificant moments but their inclusion serves to compound the programme’s sense of realism – the audience is aware that technical errors can occur during live broadcasts and so, to a certain extent, expects to see them. As Pipes’ manifestations gain in frequency and strength so do the technical faults to the extent that the live transmission from the house breaks down into multicoloured static and is replaced with a title card that states, ‘Normal transmission will be resumed as soon as possible’. In the context of the show’s reality these glitches take on a dreadful malevolence, functioning not just to create a heightened sense of verisimilitude but working to prove Pipes’ existence: when the programme returns to the house all is seemingly normal with Greene playing a board game with Susan and her sister until Pascoe realises that it is footage from earlier in the evening and that the ghost is well and truly in the machine. The programme ends in almost apocalyptic fashion, perverted by Pipes into a séance of sorts: a wind blows through the studio, the overhead lights flicker then explode as the ghost of Pipes briefly manifests in the gantry, plunging the studio into darkness. Parkinson can still be heard, mumbling as he stumbles around the studio. The transmission returns and he approaches a camera, reading a nursery rhyme from the autocue, his voice slipping into the possessed drawl of Pipes. 2 The public’s response to Ghostwatch varied considerably: one complaint received by the BBC was a request for financial reimbursement for a man who had soiled his trousers, in fear, while watching the programme; schools apparently cancelled their lessons on Monday morning to discuss the programme with frightened children; the British Medical Journal cited Ghostwatch as the first television programme to cause post-traumatic stress disorder in children (4 February 1994); and in a much more serious manner, the programme was blamed for the suicide of Martin Denham, yet at the inquest into this death, the coroner did not once mention the programme or the possible effect it had had upon Denham. 3 The public’s reaction to Ghostwatch is recorded and evaluated in Panic Attacks: Media Manipulation and Mass Delusion by Robert E. Bartholomew & Hilary Evans (Sutton Publishing, 2004) and Media Studies: Texts, Production & Context by Dr Paul Long and Tim Wall (Longman, 2009).